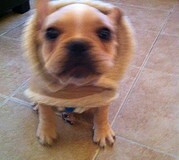 New Video: Hercules the French bulldog in his new shearling. It was very cold outside so little Herc wanted to wear his new shearling. New Video: Hercules playing with toys and shows off bark!